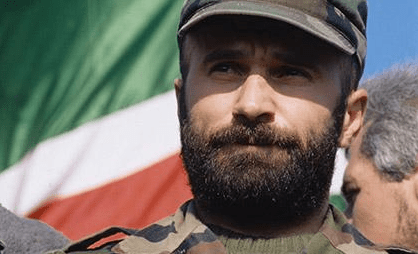 Anzor Maskhadov is the son of the now-deceased former President of the Chechen Republic of Ichkeria, Aslan Maskhadov. For anyone who’s not familiar with the history here, here’s a quick run down. In 1991, after the USSR crumbled, Chechens fought for their independence from Russia – who, of course, was not willing to let go just yet. Actually, if you start in 1944 you might remember Stalin’s orders to literally kick out the entire Chechen population on the suspicion they were all cavorting with the Nazis. Yeah. The entire population. They removed almost 400,000 Chechens from the Caucasus and some estimates say almost 30% died during the deportation. This, of course, took place while over 40,000 Chechens were fighting for Russia in WWII. It was only after Stalin died that Chechens began to return home – only to find their homes and towns taken over by new inhabitants. Were they angry? Of course. Raw deal doesn’t cover it. So back to 1991 and the fall of the USSR. Two wars were fought between Russia and Chechnya, from 1994 – 1996 and 1999-2009. Maskhadov was elected president after the first war ended and by the following year both he and Yeltsin signed an agreement to end the warfare. However, in 1999, Russia accused Chechen rebels of bombing attacks throughout Russia (Ryazan) creating a setback in peace talks. However, unfortunately for the Russians and like something straight out of a conspiracy book, investigations uncovered evidence that showed Russia may have had a hand in the bombings in a bid to undermine support for Maskhadov’s government. The 2002 Kaspiysk bombing was also an alleged false flag. Man, those dirty, dirty, Russians. But don’t get me wrong. Chechen rebels committed their own set of atrocities. At this point, you could ask the West what happened next and they’ll tell you Maskhadov was a moderate whose main objectives were peace between the two nations and the rebuilding of Chechnya. Ask Russia and they’ll tell you that Maskhadov was just as much a terrorist as his former Vice-Prime Minister, Shamil Basayev. Basayev was the one who formed the “Riyadus Salikhiin Suicide Battalion” (does that really need an explanation?) and was behind the Moscow theater hostage crisis, although, again, some investigations point to Russia and the FSB being involved. The bottom line? 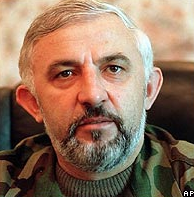 Maskhadov was involved with Basayev in some capacity. Exactly how involved he was with Basayev’s terrorists acts? That seems up for debate. The second war started in 1999 with Russia’s invasion of Chechnya. The eventual toppling of Maskhadov’s government led to the Motherland obviously putting their own Russian puppet in power which, of course, worked out for everyone said no one ever. But before Russian forces took control in 2000, Maskhadov appointed Ilyas Akhmadov as his foreign minister. Ilyas, in turn, appealed to the UN, PACE and even the US Congress asking for an observance of human rights during the war. He visited the US on many occasions and in 2002 he claimed asylum. Homeland Security shot down his claim, arguing that he was a terrorist in bed with other terrorists. Akhmadov, interestingly enough, never denied that he was at one point was close to terrorists like Basayev. What later became obvious was that Homeland Security did not get the memo that the neocons in Washington thought Maskhadov’s government leaned towards “moderate” policies and that Ilyas Akhmadov was here to stay. Alexander Haig, Senator McCain, Madeleine Albright, Frank Carlucci (Secretary of Defense ’87-’89, National Security Advisor – Reagan, Deputy Director of the CIA, Co-founder of the Trilateral Commission) and more went head to head with them with Homeland Security eventually losing out. Akhmadov’s’ biggest supporter? 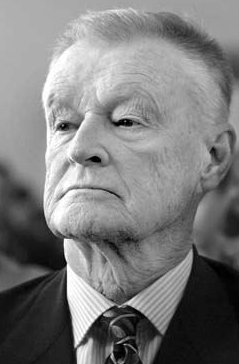 Zbigniew Brzezinski. A look at Brzezinski’s history includes a member of Council of Foreign Affairs (oh, look, there’s that name again) and the Bilderberg Group, former Board of Director for Jamestown Foundation and the Freedom House, former National Security Advisor, and a Co-Chairman of the American Committee for Peace in Chechnya. I wish the list ended there. It doesn’t come close but who’s got the time? Bottom line is that you know where this is going. 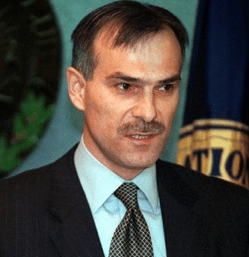 In August of 2004, the U.S. Courts (in Boston) granted Akhmadov asylum where he remained the foreign minister for Maskhadov—who, of course, was still back in Chechnya fighting. Obvious questions are, “Why were we harboring a terrorist?” and “How would the U.S. feel if Russia had given Bin Laden asylum?” Yup, I gotcha. They’re all good questions depending on with whose team you’re siding. And I can assure you, Russia was teed off about it. In fact, it was only three years ago that protestors stormed the US Embassy in Moscow demanding Ilyas Akhmadov’s extradition for war crimes and terrorism after Washington D.C. held a presentation to honor Akhmadov’s new book. Don’t remember seeing that on the news, do you? Like Victor Blok and many others, Ilyas Akhmadov landed in Boston during his fight for political refuge because he had friends in the area. A man by the name of Max Kampelman, another co-chairman for the American Committee for Peace in Chechnya, arranged for Akhmadov’s free legal representation while another man by the name of Nicholas Daniloff took Akhmadov into his home for over a year – even got him a job in Vermont. Have you ever heard the Nicholas Daniloff story before? No? Oh, this is pretty good. In the end I think it took about thirty days for the U.S. to get Daniloff released and back in the States. Why was he released, you ask? Well, let me tell you another tale about one Gennady Zakharov, a Soviet physicist. 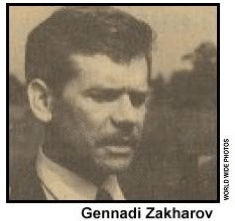 Gennady Zakharov enjoyed his time in the States as a spy for Russia. His friend, who is only known as C.S, had known Zakharov for about three years and was helping Zakharov secure “a job with a defense subcontractor.” In 1986, about one week before Daniloff was kindly given a ride to the local Gulag a continent away, Zakharov met up with C.S. at a NY subway station where C.S. handed over classified documents about U.S. Air Force jet engines. The FBI immediately arrested Zakharov and took him in. C.S. had apparently been working for the U.S. government all along. The U.S. claimed that Daniloff’s abduction a week later was a retaliatory act against the arrest of Zakharov. The U.S. and Russia made a deal to swap both men and voila! both men walked. Easy peasy. Yup. The he’s a fan. Nice. You’ve been busy. The Maret,Ruslan Baiev connection could be very important. It’s a whole ‘nother post. Northeastern…what is going on at that place?! Oh right, I think we already know. Wow, I like the comparison. I’ll have to look into Karima T. Not familiar. Thanks you! Fantastic investigative reporting, Jimmys! Brian GW, Aunt Maret, Misha (my fave) with a healthy splash of Uncle Ruslan, all of whom will be introduced at trial when the defense presents their case. Any juror will immediately see the immense amount of Hinky with a capital H that was going on arounf the Tsarnaev brothers and Todashev. I’ve only just begun to explore the links here, but I’m looking forward to learning all about this tangled web. Great job!